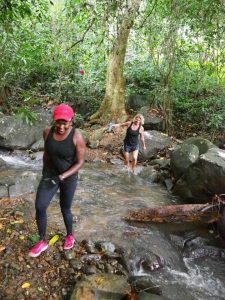 Hash #957 was held at the Providence Junction in St, David’s and two lovely trails were set though this lush jungle terrain by our Hash Mistress Commando, Girl Guide and Saber Tooth. The rain the previous evening and that morning ensured that all hashers shoes and a few rear ends were covered in mud. 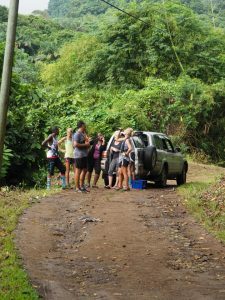 Both trails were at least 90% bush and the runners trail had 4 river crossings through the lovely clear waters – which you needed just to give your hands a quick wash after scrambling and sliding up and down the slippery mud slopes. Commando already in the Christmas spirit had a beer/water stop halfway through the hash – Thanks Annie – that was a pleasant surprise for all the hashers! We had a few visiting hashers from the UK and they said they enjoyed the GH3 hash so much that they will be coming back for our 1000th hash next year. DJ Garvin provided the music and luckily the rain held off for the rest of the day and evening, so hashers could enjoy their food, drinks and lime.